This English article is written based on "kathA sangraham" (short narration of the incident) which was part of the book "kaisika mAhAthmyam" published by puththUr srI u vE krishNaswAmy iyengAr, Editor, "srIvaishNava sudharsanam". This is a short narration of the kaisika purANam which is part of srIvarAha purANam. This article narrates the life of nampAduvAn (an ardent devotee of thirukkuRungudi nambi emperumAn) and his conversation with a brahma rAkshasa (a brAhmaNa who was born as a rAkshasa due to the mistakes he committed while performing yAgams in his previous birth) on an EkAdhasi night. Long ago, the earth became submerged in the "praLaya jalam" (causal ocean). At that time, emperumAn assumed a form of a wild pig which does not hesitate stepping into water/mud, jumped into the causal ocean, rescued the earth which was stuck in the walls of the universe using his sharp-teeth (which looks like a tusk), gave sufficient strength for the earth to sustain further, consoled bhUmi pirAtti (one of the primary divine consorts of srIman nArAyaNan - who is the controlling dhEvathA) for earth and embraced her. At that time, bhUmi pirAtti feeling grieved for the suffering souls who are residing in the earth and wondering how they will be uplifted, asks emperumAn to show an easy path for her (their) children and emperumAn says"if they glorify me, they will be uplifted from this samsAram" and explains the life of nampAduvAn to demonstrate the means of "nAma sankIrthanam" (singing the glories of emperumAn). emperumAn is mercifully present in the dhivya dhEsam named thirukkuRungudi along with srI dhEvi and bhU dhEvi (who are his primary consorts). In the outskirts of that dhivya dhEsam, there lived a great devotee of emperumAn, who was born in a chaNdALa (dog-eater - who are outside the varNa system) family. Every night, he approaches the sannidhi of emperumAn along with his vINA (veeNai is a string instrument), stays at the proximity allowed for him in sAsthram, sings songs glorifying emperumAn with melodious tunes in his vINA and returns to his residence before the residents of the dhivya dhEsam wake up. Because of this, he became to be popularly known as "pAduvAn" (one who sings). emperumAn too greatly cherished him as "nam pAduvAn" (my singer). Thus, he served emperumAn for a long time. 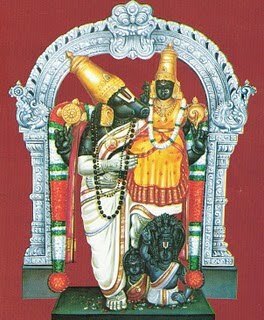 Once, on a kArthikai month sukla paksha EkAdhasi night, on pursuing jAgratha vratham (being awake throughout the night and singing the glories of emperumAn), nampAduvAn was heading towards thirukkuRungudi nambi sannidhi carrying his vINA. At that time he meets a brahma rAkshasa (a brAhmaNa named sOma sarmA who was born in a brAhmaNa family, yet committed mistakes while performing yAgam (fire sacrifice) and due to that, he was born as a demon). The rAkshasa was greatly hungry/thirsty and was waiting for his pray. Seeing nampAduvAn, the rAskhasa says that he was going to eat him. Hearing that, nampAduvAn becomes happy since he was any way not attached to his body and he is also helping to fulfill the hunger of the rAkshasa in the process. But since he wanted to complete his jAgratha vratham and wake up emperumAn with his divine songs, he says to the rAkshasa "I am glad that you will kill and eat me. But I will go to thirukkuRungudi, bring joy to emperumAn through my songs, complete my vratham and will swiftly return to you - just give me some time". rAkshasa replied "This is just a trick to escape from me; once I let you go, you will not return to me". At that time, nampAduvan declares many vows to bring confidence in the mind of rAkshasa. Hearing those vows, the brahma rAkshasa becomes convinced that nampAduvAn will return and lets him go. nampAduvAn too reaches emperumAn, sings his songs giving great pleasure to emperumAn, feeling great joy about giving up his body, swiftly returns to the brahma rAkshasa and asks the rAkshasa to eat him. brahma rAkshasa, at once realizes the greatness of nampAduvAn, requests nampAduvAn to give the fruits of his glorification of emperumAn to relieve himself from the rAkshasa life. nampAduvAn at first refuses [since he does not want to ask emperumAn any favour in return for his kainkaryam]. But the rAkshasa begs nampAduvAn to help him be relieved from his situation with the fruits of at least one song that he sung during the night for emperumAn. nampAduvan finally agrees and gives the result of a song which was sung with "kaisika" tune/meter. Being relieved from his situation, the rAkshasa gave up his demoniac body and ascends to auspicious abode. 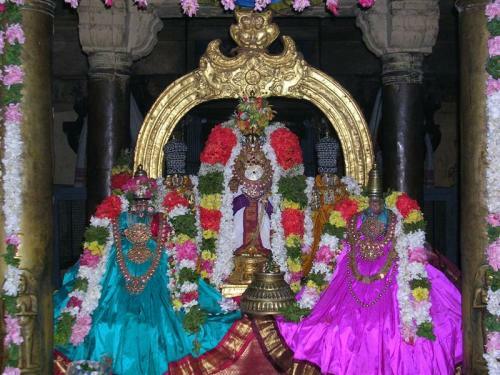 nampAduvAn continues to perform his kainkaryam to emperumAn that is pleasing for emperumAn and eventually reaches paramapadham (the divine permanent abode of srIman nArAyaNan). This charithram was narrated by srI varAha nAyanAr (emperumAn) to bhUmi dhEvi. Thus ends the short narration of this glorious incident. As said in "sathyam bhUthahitham prOktham" (truth is that which is said for the well-being of all) - crossing the boundaries of truth [slOkam 33]. More cruel than that - being engulfed with lust, engaging with the wives of others [slOkam 34]. More cruel than that - when oneself and some one else is eating, discriminating in the food stuff [slOkam 35]. More cruel than that - giving land in charity to a brAhmaNa and grabbing it back [slOkam 36]. More cruel than that - enjoying a girl when she was young and failing her in her old-age finding some faults in her [slOkam 37]. More cruel than that - performing pithru srAdhdham (rituals for ancestors) in the form of tharppaNam on amAvAsyai and subsequently engaging sexually with ones own wife on that day [slOkam 38]. More cruel than that - blaming/abusing the person who gave food [slOkam 39]. More cruel than that - promising to marry ones daughter to some one and not fulfilling that promise [slOkam 40]. More cruel than that - eating without taking bath on shashti, ashtami, amAvAsyai and chathurdhasi days [slOkam 41]. More cruel than that - promising to do charity and subsequently refusing to do so [slOkam 42]. More cruel than that - engaging sexually with the wife of a friend who has helped greatly [slOkam 43]. More cruel than that - engaging sexually with the wife of Acharya who facilitates liberation and the wife of king who provides material comforts [slOkam 44]. More cruel than that - marrying two women and showing favouritism towards one [slOkam 45]. More cruel than that - failing the chaste wife in her youth though she is fully dependent [slOkam 46]. More cruel than that - stopping a herd of thirsty cows that go to drink water [slOkam 47]. More cruel than that - the sins that are given by elders to those who are engaged in five great sins such as killing a brAhmaNa, etc [slOkam 48]. More cruel than that - worshipping other dhEvathAs instead of vAsudhEvan [slOkam 49]. More cruel than that - considering other dhEvathAs at par with srIman nArAyaNan [slOkam 50]. While the brahma rAkshasa did not become convinced after hearing the first 17 vows, on hearing the 18th vow, he became convinced. Since the sin that was identified in the 18th vow is the most cruel one which will make the jIvAthmA to be eternally bound in this samsAram, the brahma rAkshasa believes that the nampAduvAn would not want to take up such sin and lets him go. From this, we can understand that considering other dhEvathAs at par with srIman nArAyaNan is the most cruel sin. The main essence of this kaisika purANam is for the intelligent persons to completely eliminate that sin. This purANam is recited in many dhivya dhEsams on kaisika EkAdhasi [or dhvAdhasi]. In thirukkuRungudi itself, this purANam is played as a drama on stage. As said in periya thirumozhi 4.4.3 "silambinidaich chiRu paralpOl periya mEru thirukkuLambil kaNakaNappa" - I worship that emperumAn in whose feet, the (huge) mEru mountain looks like a small particle, I worship that varAhap perumAL who lifted up the earth effortlessly. I surrender unto bhUmi dhEvi who was lifted up by varAha perumAL from the causal ocean, who is like a black beetle in the jasmine flower that is the tusk of varAha perumAL. Let srI parAsara bhattar bestow me with all auspiciousness. He is the purOhitha of srI ranganAthan, the son of srIvathsAngar (AzhwAn/kUrEsa) and is greatly filled with kainkaryasrI (wealth of servitude).